Love is in the air here at Essential Print Services and the Print Angels are dusting off their wings and polishing their harps in readiness of the most romantic day of the year! In a world full of automated option menus, meaningless recorded messages and bulging inboxes, it’s all too easy to forget that it is actual human beings that keep the important cogs turning. 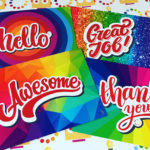 A few personal words, addressing important customers or clients as valued individuals, will go a long way in making them feel extra special, but above all, feel appreciated. A simple hand written “thank you” at the bottom of a compliment slip or printed invoice will speak volumes when your customer unwraps their order. Not only will it create that warm, fuzzy feeling but it’ll ensure that it’s your company name and brand they think of first when they come to placing a repeat order. To REALLY make an impact, you could include a small token of appreciation within the packaging, a nice and completely unexpected little extra! A printed pen or small printed notepad will work wonders. These stationery items will remain on clients’ desks for weeks and months to come. If you post invoices and statements to your customers, use notelets to include a personal message or reminder in the envelope – it will remind the recipient that there is a real person behind what could be perceived as an automated activity. Newsletters and brochures can be easily personalised with the client’s name, company and preferences. Printing the clients’ names throughout a document will ensure keep their attention throughout the document. If you’re struggling to find the right words to say or don’t know what to buy, fear not, we’re here to help! There’s nothing that we enjoy more than talking to people like you about their requirements – we can help make it all happen! Think of us like your printing match makers. So why not create a loving impression this February 14th and let our top notch printing make you look the business. PreviousPrevious post:Top 10 Reasons to Choose Us As Your PrinterNextNext post:We're hiring! Will you be our next Print Angel?